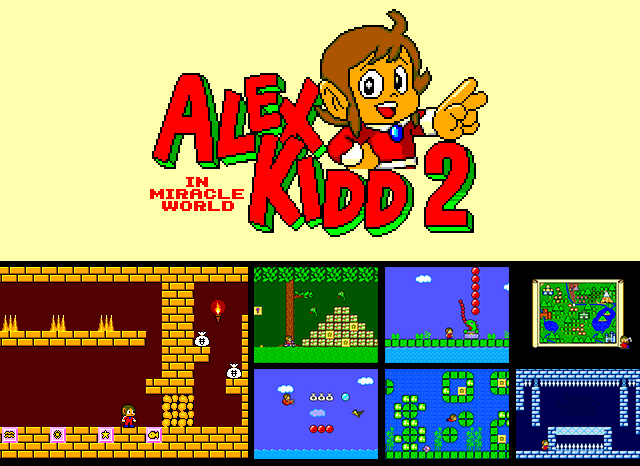 Alex Kidd in Miracle World 2 is essentially a fan-made ROM hack of the original game. It uses the same game engine (with some custom modifications) but introduces a whole new set of levels and other features. It was designed as a direct sequel to the original game and ignores the events of Enchanted Castle on the Mega Drive. I came up with the concept for this game back in 2012 when I first started learning how to ROM hack the original Alex Kidd in Miracle World game. I learned how to manually change things in the code such as the level layout, sprites and palettes. From this, I felt inspired to create the sequel I'd always wanted to see. I started drafting some story and level design ideas and even sketched a new game map. However, I quickly realised that creating a full-blown sequel from my limited knowledge and experience, was going to be too big a job for me. So I set my notes aside and didn't give much more thought to the idea. Fast forward a few years and I discover the brilliant program KiddEd (created by Calindro). KiddEd is a comprehensive and easy-to-use ROM hacking tool designed specifically for Alex Kidd in Miracle World. With that, I was able to realise my vision. I started work on my game in May 2015 and I completed it exactly 2 years later, in May 2017. During the development, I have recruited fantastic support from various people, all offering their time and expertise out of passion for the project. Around half-way through development of the game in April 2016, I submitted a WIP version of the game to the SMS Power! coding competition. From that, I received a lot of supportive comments and suggestions for improvement. I've also had several people play-test the game along the way. All this feedback has proven invaluable and has made me strive to make the best game possible for the fans. It's been 6 months since Alex defeated Janken the Great and reclaimed 'The Crown'. Alex's brother Egle has taken the throne and oversees the city of Radaxian. There is still unrest on the planet Aries however, as monsters continue to roam the land. Alex is still greatly concerned by the whereabouts of his missing father. Radaxian's forces have been unable to locate King Thunder, so Alex sets off himself to find him. He retraces his steps and returns to the place where the trail was lost. Perhaps there was something he missed? Alex must further explore the Miracle World, traverse dangerous lands and use the art of Shellcore to defeat his enemies. He once again has his motorcycle and peticopter to help him get around but now he also has a plane to fly him across treacherous waters. Experience even more action in Alex's greatest adventure yet. Once again, it takes a Kidd like you to handle this even greater challenge.